Randy Black loved to cook chili. Thomas Randall “Randy” Black died Sunday, March 24 after a brave, three-year battle to survive following a massive stroke. Black was born on Dec. 7, 1945 in Fort Worth, Texas. 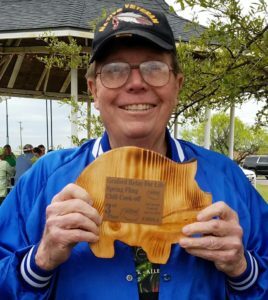 He was raised in Dallas and graduated from Highland Park High School in the class of 1965 as a proud member of the Lads & Lassies singing group. He then attended journalism school at the University of Oklahoma and graduated from Texas Tech University in 1971. He married his first wife, teacher Linda Evans, in 1969 and began working as a photojournalist for The Dallas Times Herald. Black covered golf legend Lee Trevino winning his first international tournament and the British Open in 1971. Black himself played in the Swiss Open Golf Championship in 1977. He won a prestigious Katy Award his first year at The Dallas Times Herald. Black photographed many celebrities throughout his career, including soccer great Pelé, The Boston Pops’ Arthur Fiedler, performer Mitzi Gaynor, actress Helen Hayes, Britain’s Prince Charles and many others. Black continued his professional career as a photographer with a studio at Olla Podrida in the 1970s. In his own words, Black was an, “Adventurer, traveler, writer, photographer, student chef and lover of French cuisine.” He spoke many languages, was a private pilot and traveled the world extensively, making new friends wherever he went. One of his favorite adventures sent him to teach English studies to Russian students in Omsk, Russia in 1993. While there, he studied Russian history and met his future bride, artist Olga Karsakova. They married in 1994 and moved back to Dallas. In 2000, they welcomed their daughter, Natalya, into their family. Black continued his career working with Southwest Securities, and then as a web designer while writing his first novel, “Randy Black’s Tales from Siberia.” He was a Fellow of the World Association of International Studies, a substitute teacher for the Allen Independent School District and an avid Terlingua Chili Cook-off fan and participant, with his “Flash in the Pan” award-winning chili recipe. Black is preceded in death by his parents, Air Force Lieutenant Perry Johnson and artist Bronson Charles, and his mother-in-law, Zoia. He is survived by his wife of 25 years, Olga, and daughter, Natalya; brother Warren “Tad” Black and his daughter, Katharyn; sister Dr. Suzanne Douglas Black and her wife, Melissa; and sister Nancy Black and her children, Max and Preston; cousins Victoria DeBerry, Nez Hallett III, Karl Hanson, Kyle Hanson and their families; and numerous friends and colleagues throughout the world. The family wishes to express its appreciation and thanks to the dedicated staff of Belmont Twin Creeks in Allen, CaringBridge and to the compassionate members of Elysian Hospice Care. A private memorial service will be held at a later date. If you would like to honor Randy Black’s memory, please consider a donation to your favorite charity or to The Stroke Center of Dallas at strokecenterdallas.org.